Call the Midwife and Puff Sleeves! PBS has brought us another engaging period drama from the UK with Call the Midwife. Now in season two it follows the lives of the young midwives and the nuns of Nonnatus House, located in the East End of London in the late 1950s. Based on the memoirs of Jennifer Worth it is a touching and charming look into a way of life that really isn’t that far in our past. Jenny is seconded to a short staffed London Hospital to work on the male surgical ward and finds herself working under an intimidating surgeon, Mr. Tracey. Back in Poplar the midwives have a new addition to the household, Jane, who lends a hand in Jenny’s absence. In one of their most unusual cases, the nuns and midwives are introduced to a forthright pair of twins Meg and Mave Carter. The two women are identical in every way; they even share a husband; except one of them is now pregnant. These puffed sleeves are out of control! They are the sleeves Anne Shirley pined for in Anne of Green Gables. The lilac color is lovely especially with the crisp white of her apron and hat. It’s funny to imagine this as a uniform in the surgical department of any major hospital these days but that’s what makes period shows fun. I love the glimpse into the past. Here’s a behind the scenes clip for more looks at the fun fashions. 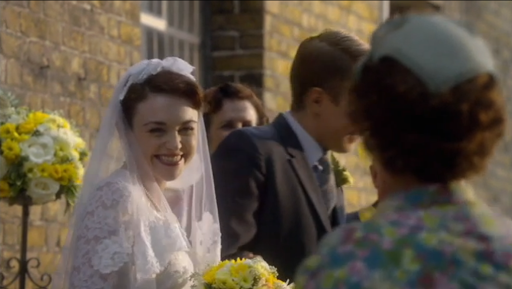 We also get a brief look at a fifties wedding at the end of the episode. 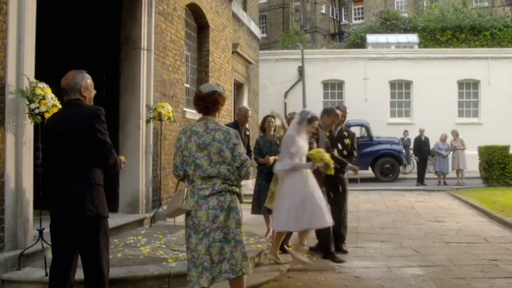 The screenshots aren’t great but the wedding gown is a pretty lace tea length dress with a lace veil. Beautiful! 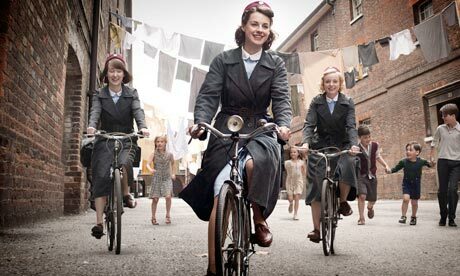 What do you think of Call the Midwife?